The latest from stop-motion animation masters LAIKA studios is “Missing Link,” another astonishing leap forward with spectacularly gorgeous settings and characters so subtly expressive that the animators are as much a part of the performances as the outstanding voice talent. 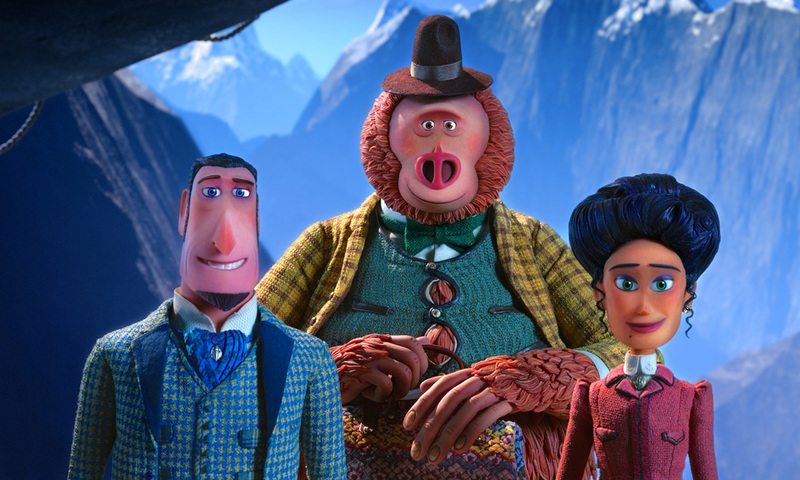 With less of the sadness-tinged depth of the four previous LAIKA films, “Coraline,” “ParaNorman,” “The Box Trolls,” and “Kubo and the Two Strings,” “Missing Link” has more silly humor and a grander scope of adventure. The previous films were unusual both in bringing themes of loss, grief, death, and depression into films for families as they were in the high-touch textures of the made, not digitized world. This one is more conventional in its narrative, for the first time with adults (if some immature ones) as the lead characters. Like all of the others, it is stunningly beautiful and gorgeously realized. It is the story of a time when the combined innocence, ambition, and hubris we may now think of as privilege meant that gentlemen had a certain noblesse oblige that led to undertakings falling somewhere between audacious and downright crazy. We will see a fact-based movie about perhaps the most downright crazy later this year in “The Professor and the Madman,” with Mel Gibson and Sean Penn as two of the men behind the Oxford English dictionary, working for decades to document every single word in the English language. This was an era when an educated, if not exactly employed, gentleman was expected to be as curious and knowledgable about nature as about poetry. For these men, the world, especially the undocumented world, was one great big museum, laboratory, encyclopedia, and, we have to admit it, playground to be colonized, captured, pillaged, and otherwise grabbed. And then of course they came home so they could brag about it in their tony, mahogany-paneled, leather-chair furnished, and very, very, very exclusive clubs. We first see Lionel trying to document the Loch Ness monster, so intrepid himself that he is unable to notice the extreme distress of his sidekick, who gets chomped as Lionel is ordering him to take a photograph. That relationship ends quickly. But Lionel gets a letter that he thinks will lead him to membership in the Optimates at last — someone wants him to find the elusive Bigfoot/Sasquatch creature, the possible missing link between apes and humans. And it turns out that someone is Bigfoot himself, or, as he will soon be known, Susan (voice of Zach Galifianakis). Susan is the last of his kind, and he needs the help of an experienced adventurer to take him to his nearest relations, the Yeti in the mountains of Asia. Their goals are different. Lionel wants the triumph and fame of being known as the one to find Bigfoot. And he wants the Optimates Club to let him in. Can he do that and keep Susan safe? The journey begins, from one breathtaking vista to the next. Please, see this film for the first of what I expect will be multiple viewings, on a very big screen. It will knock you out. Lionel needs a map, which means he has to contact Adelina Fortnight (Zoe Saldana), the widow of his romantic and adventuring rival. She is every bit as brave as her husband, and joins the expedition. They go from one spectacular location to another. The fact that the characters are real-world dolls or puppets and that the environments around them are all built with meticulous attention to the tiniest of details, each frame of the 24 frames per second film shot individually makes the world of the story especially inviting, immersive, and tactile. You could spend all day watching it over and over and you still would not see how the tiny flutter of a leaf as an elephant passes by makes the world of the film so real, but subliminally it helps to create not just an authenticity of the physical world but the kind of authenticity only the vision of true artisans with endless commitment and creativity can make come to life. Susan’s group is being tracked by Stenk (Timothy Olyphant), hired by the head of the Optimates Club to stop them. This conflict is the weaker part of the film. The theme of what groups we want or should want to be a part of and what groups want us to be a part of them is a fine one, but it is far from unexplored, especially in family movies, and does not have the nuanced portrayal we have come to expect from LAIKA. The ending is a bit abrupt, suggesting a possible mid-course change of direction in the midst of the painstaking filming process. But the adventure, engaging chemistry between Susan and Lionel, and easy-going humor keep things moving along, with the Missing Link teaching the man something about what humanity. It is telling that when someone needs to give mouth-to-mouth resuscitation to an elderly woman, Lionel’s first thought is to make Susan do it and Susan’s first concern is to make sure his breath does not offend. The real star here is the visuals, from vast, breathtaking vistas to genuine emotion in the subtlest facial expression, are an extraordinary achievement. As always I look forward to whatever LAIKA does next. Parents should know that this film includes peril and some violence (no one seriously hurt) and some potty humor and mild language. Family discussion: How did Lionel change his mind about what was important? What will Adelina do next? June (Brianna Denski) and her mother (Jennifer Garner) love to spend time together imagining the details of a fabulous theme park called Wonderland. June has planned out all of the details, from the animal characters who welcome all the visitors to the merry-go-round with flying fish instead of horses. Like Christopher Robin, June has created a magic land for her toys, including genial Boomer the bear (Ken Hudson Campbell), who struggles with a hibernation-related form of narcolepsy, energetic beavers Gus (Kenan Thompson) and Cooper (Ken Jeong), nervous porcupine Steve (John Oliver), voice-of-reason wild boar Greta (Mila Kunis), and Peanut the chimpanzee (Broadway star Norbert Leo Butz, who translates June’s plans into the park’s attractions. June does more than imagine — she builds a scale model of the park that extends through the house. And she builds a go-kart with her best friend, Banky (Oev Michael Urbas) that works very well except for the steering and the brakes, which leads to quite a wild ride through the neighborhood. June gets into trouble for that, but there is something much more devastating ahead — her adored mother is very sick, and must leave home for some special treatment. June’s entire sense of the world is turned upside down. She destroys her model of the Wonderworld. And, as people often do when they cannot handle uncertainty in one part of their life, she becomes fixated on what she can control, trying to take care of her father by worrying much too much. The milk in the fridge is just three days from its expiration date! Better get rid of it! On the bus to math camp, June decides it is too much of a risk to leave her father alone, so she gets Banky to pretend to be sick and sneaks out to walk home through a forest. She discovers a version of the very Wonderland she designed, but it is under siege by tiny little zombie creatures (but cute ones, not super-scary). Only she can save the day. It is too bad that the character design is bland as written and visualized, despite the best efforts of the talented voice performers. There are unaccountable and annoying detours into crushes — Banky’s on June and Steve’s on Greta. But the Wonderland is indeed wonderful and the message of imagination as a sustaining source of comfort and a path to understanding is wonderful as well. Parents should know that this film includes fantasy-style peril and action violence and serious illness of a parent, some schoolyard language, and some childhood and animal character crushes and a kiss. Family discussion: Why did Peanut hide out? What kind of amusement park ride would you like to create? How do you keep the light inside you shining? It was a delight to read Jeremy Fassler’s ranking of all of the Oscar-winning animated shorts for New York Magazine’s Vulture. 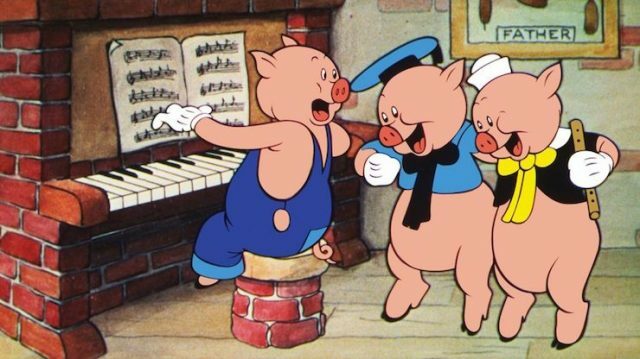 From Disney’s “Three Little Pigs” (which introduced the song “Who’s Afraid of the Big Bad Wolf?”) at #12 to the Hubleys’ “Moonbird” (#30), Herb Alpert songs (#59), and “The Hole” (#7) (John Hubley also worked on #4, “Gerald McBoing-Boing”) and Nick Parks’ “A Close Shave” (#43) and “The Wrong Trousers” (#1), from powerhouses like Tom and Jerry and Disney to one-offs like the Polish director who ended up in jail with his Oscar after he misplaced his ticket and got into an altercation with the security guard who would not let him back into the theater, it is an entertaining and insightful look at some of the greatest animated talents of all time. Next PostNext How Does a Critic Watch A Movie? 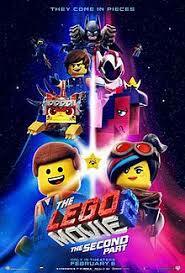 “The LEGO Movie 2: The Second One” is a great big box of happiness in part because of its non-stop cheeky humor but also in part because it deals subtly but frankly with three of the most annoyingly painful and near-universal human experiences: fighting with siblings, adolescent moodiness, and stepping on LEGOs in bare feet. The first movie ended with a surprisingly meaningful and warm-hearted pivot from animation into live action as it turned out the entire story had been grounded in a conflict between a boy who wanted to play and a dad who wanted his LEGO world to be pristine and orderly. The kicker at the end was that the touching reconciliation between father and son was followed by the arrival of the preschool sister with her toddler-sized Duplos, who had her own destructive powers. There’s a bit more live action in this sequel, and we see more clearly the relationship between what is going on in the lives of the real-life family and the imaginary play of the two children, now five years older but no more interesting in joining forces. Once again, Emmet (Chris Pratt) thinks everything is awesome, barely noticing that the bustling metropolis of Bricksburg has turned into a post-apocalyptic wasteland known as Apocalypseburg (“a heckish place to live”). Lucy (Elizabeth Banks), formerly known as Wyldstyle, tries to teach Emmet how to brood properly. “Look out into the distance and say whatever grim thoughts you have in a deep voice.” As we saw at the end of the last film, the Duplos arrive from the Systar System. When they take Lucy, Emmet follows to rescue her. Adults will catch onto the names of some of the perils our dauntless hero faces along the way, like Queen Watevra Wa’Nabi (a perfectly cast Tiffany Haddish), Systar, the dreaded ArMAMAgetin, and that notorious hiding place for LEGO figures, Undah de Dryah. That is, if they are not trying to get the film’s guaranteed new hit song, “The Catchy Song” (“This song’s gonna get stuck inside your head..”), or laughing too hard at the avalanche of pop culture meta-references, especially a song that takes on every iteration of Batman from Adam West to Christian Bale and a new character who not only bears a strong resemblance to Emmet but to his portrayer, Chris Pratt, as well. It’s fast, fresh, fun, and funny, with a skillful mix of silliness and action and some random call-outs to celebrities from Justice Ruth Bader Ginsburg (who’s having quite a moment on screen these days) and Bruce Willis, back where he should be, crawling through heating ducts. But it has something interesting to say about how we decide when to change and when not to, and about its female characters. And watching it just might ease the pain not just of the universal experiences mentioned above, but of that other heartbreak — having your children grow out of childhood. Parents should know that this film includes fantasy/cartoon-style peril and slapstick humor and some potty humor and schoolyard language. Family discussion: Why did Lucy want Emmet to change? What do you do when everything’s not awesome?